Various critiques of transboundary natural resource governance in southern Africa have questioned the efficacy and social equity dimensions of prevailing strategies for protecting transnational ecosystems, highlighting the importance of sociological research on the potentially ‘other-ing’ impacts of mainstream conservation policy discourse. We draw on research in the Chimanimani Trans-Frontier Conservation Area (TFCA) on both sides of the Zimbabwe–Mozambique border, scrutinizing simplifications inherent in terms such as “illegal foreigners” that obfuscate histories and contemporary realities of cross-border social ties. Engaging perspectives of park authorities and chiefs as well as people who have taken up artisanal mining, we explore two related themes—how ‘belonging’ is negotiated as well as how conservation agendas are instrumentalized by state and non-state actors. 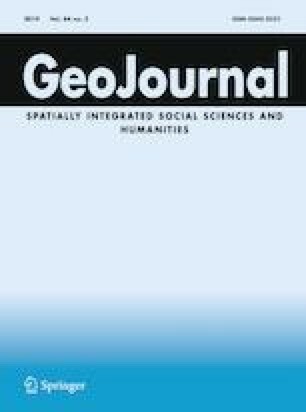 Bringing attention to gaps between policy discourses surrounding TFCAs and territorialized practices of exclusion, the article concludes by calling for greater attention to the mutating significance of colonially established boundaries as well as the dynamic influences of social networks in borderland spaces. Transboundary natural resource management (TBNRM) has for many years been a prominent theme in southern Africa, as a notion that seeks to catalyze common strategies for protecting transnational ecosystems and promoting sound development (Wolmer 2003; Hanks 2003; Büscher 2013). One of the main rationales for establishing transboundary resource management initiatives in southern Africa has been that the region’s richest and best preserved biodiversity and natural habitats often lie next to national borders—with watershed and wildlife needing protection through collaborative structures (Ramutsindela 2014). However, several critiques have articulated ‘fears that border communities, already at the margins of social, political and economic opportunities, will become further isolated through TBNRM initiatives’ (Katerere et al. 2001:4). In various parts of Africa, changing patterns of cross-border migration are raising critical concerns about how policymakers address livelihood insecurity in informal economies, rendering notions of transboundary conservation exceedingly complex (Andersson et al. 2017). As areas earmarked for borderlands conservation are often characterised by multiple land uses (agro-pastoralism, tourism, conservation and other activities), changing economic pressures have been reconfiguring how different actors view competing claims, in some cases seeing entrenched patterns of land alienation (Ramutsindela and Sinthumule 2017). In this article we explore competing claims and social relations in the Chimanimani Trans-frontier Conservation Area (TFCA) along the Zimbabwe–Mozambique border, where migration has long been a strategy in response to economic and political-induced displacements. In the 1990s and early 2000s, work exploring social and cultural dimensions of resource management in the Chimanimani region focused on situations where Mozambicans took refuge on the Zimbabwean side of the border in the face of civil war and forced displacement (McDermott Hughes 2001; Schafer and Bell 2002). Conversely, there was an increased flow of people from Zimbabwe to the Mozambican side of the border due to economic crisis in the mid-2000s (Derman and Kaarhus 2013). Much migration generated what Hammar referred to as ‘ambivalent mobilities’ (Hammar 2010)—recognizing differentiated perspectives of local communities towards mobile populations as well as diverse emotions experienced by mobile populations. There have been particular concerns about migration in relation to artisanal and small-scale mining—as reflected by condemnations of illegal mining in several newspapers regionally and internationally (Thielke 2008; IRIN 2007). Following the discovery of alluvial gold deposits in 2004 on the foothills of Chimanimani Mountains (including inside the core conservation area of Chimanimani Transfrontier Conservation Area), mining in the region became a last ditch-hope for large numbers of Zimbabwe migrants who faced a deteriorating economic situation (Thielke 2008; Ndunguru et al. 2006; Swradio Report 2007). In the years since, multiple policing campaigns and related control measures have been used in the Chimanimani TFCA by both the governments of Mozambique and Zimbabwe. This resulted, for example, in 52 Zimbabweans detained in 2006 by Mozambican authorities (Ndunguru et al. 2006), although assessments in the mid-2000s often noted that the Mozambican authorities were more laissez-faire when compared with the government approach taken in Zimbabwe (Ndunguru et al. 2006; IRIN 2007). Yet, regardless of how “illegal” or “artisanal” mining is imagined as an economic or ecological force within the TFCA, its sociological dimensions are frequently confounded. While the Southern Africa Development Community (SADC) TFCAs Programme aims to build an inclusive framework that advances the Sustainable Development Goals (including ending poverty in all forms and protecting, restoring and promoting sustainable use of terrestrial ecosystems, sustainably managing forests, combating desertification and halting land degradation and biodiversity loss; SADC 2013, 2015), the limits of inclusivity are often left unclear. We focus in this study on two related themes—how notions of ‘foreignness’ and ‘belonging’ are conceived and contested in mining spaces in the Chimanimani TFCA as well as how conservation agendas are instrumentalised by state and non-state actors. The first section below provides context by examining some of the critical scholarship on conservation schemes in this region, before outlining the methods and approach in our research. The next section explores how social networks and notions of belonging play important roles in accessing natural resources that are significant for livelihoods in the borderland area. We add to debates regarding the meanings of ‘belonging’ that consider whether people can feel and be treated ‘at home across the border’ (Madsen and van Naerssen 2003, 3) as well as what Yuval-Davis (2006) refers to as ‘the politics of belonging’ in contestations around claims based on grounds of origin, culture and citizenship. The article’s subsequent section discusses how exclusion/inclusion dynamics in accessing extractive resources relate to conservation discourses invoked by a range of actors including gombiros—a Shona word referring to one who exploits and robs—as well as the discursive framings by environmental officials and non-governmental organisations. We then consider how interdependence sovereignty—the ability of states to control movement and access to resources across borders (Krasner 2001)—is shaped by social networks, underscoring a need to understand transboundary natural resource management projects as entangled in the socio-cultural ambiguities of a hegemonic paradigm profoundly shaped by legacies of colonialism. The article concludes by arguing that the rhetoric of both ‘illegality’ and ‘foreignness’ masks shortcomings in contemporary transboundary resource management schemes, suggesting future trajectories for research that brings together insights on migration and identity, transfrontier conservation strategy and mining activity in borderlands. Measures invoked in the name of preserving biodiversity have long been contentious in southern Africa, where the history and contemporary dynamics of conservation are deeply rooted in colonial legacies (Büscher et al. 2012; Draper et al. 2004; Adams and Mulligan 2003; Van Amerom 2002; Singh and Van Houtum 2002). Protected areas with ‘fortress conservation’ paradigms have dominated nature preservation schemes for much of the twentieth century and have symbolized different meanings to different people (Hutton et al. 2005). Whilst such paradigms have been invoked as required measures for environmental stewardship, the creation—and enforcement—of protected areas has been contested for contributing to loss of livelihood and legitimacy of populations and for subjugating local and indigenous forms of environmental knowledge by Western scientific constructions of nature (Murombedzi 2003; Brockington and Igoe 2006). Duffy (1997) unpacked how fortress conservation established sets of ostensibly ‘incontestable scientific management principles’ despite being ‘based on politically and ideologically informed decisions’ (441). The history of fortress conservation in southern Africa has been widely linked to dispossession, displacements and restricted use of resources fuelling contestations between local people and authorities charged with enforcing conservation laws (Andersson et al. 2017; Lunstrum 2016; Sinthumule 2017; Bluwstein and Lund 2016; Milgroom and Spierenburg 2008). The Chimanimani TFCA has been recognized as an area of high plant diversity and endemism for more than 50 years (van Wyk and Smith 2001). It is also listed by the Critical Ecosystem Program Fund (BirdLife International 2012) as among the hotspots in the “Key Biodiversity Areas (KBAs)” in the Eastern Afromontane. In 2001, SADC supported the governments of Zimbabwe and Mozambique signing of a Memorandum of Understanding to join the Chimanimani National Reserve, consisting of 2368 km2 in Mozambique (including both core and buffer zone area), and a 200 km2 core conservation area in the Chimanimani National Park in Zimbabwe. The objectives of the TFCA were centered on conserving the biodiversity of the highlands ecosystem, conserve wildlife, promote tourism and work with communities to develop eco-tourism and sustainable resource harvesting practices (Ghiurghi et al. 2010; SADC 2015). Scholars on the Chimanimani TFCA have noted several developments in fortress conservation approaches as well as alternative paradigms that have offered comparatively less restrictive modes of control on territorial access. According to Dondeyne et al. (2012), the delimitation of community land inside the protected area of the buffer zone in the Chimanimani TFCA (in Mozambique) has been helpful for both handling conflicts and creating partnership between communities and private investors to promote ecotourism. However, scholars also noted that some settlements in the buffer zone are viewed as ‘problematic’ by both governments and conservation organizations. McDermott Hughes (2001) observed that land alienation connected to ecotourism and conservation projects in Rusitu-Haroni valley (Zimbabwean side of Chimanimani) precipitated conflicts between small-scale farmers and conservation agencies (see also Chidhakwa (2003) for analysis of resource conflicts in relation to the Department of the National Parks and Wildlife Management and the Forestry Commission). Schafer and Bell (2002) further documented power-laden contestations in some of the conservation areas in Chimanimani, arguing that the state can use natural resource management schemes ‘as a means to extend its reach in rural areas, rather than devolving control to local communities’ (401). In the mid-2000s new discoveries of gold and diamonds in the area reconfigured the social and economic dimensions of resource extraction in the Chimanimani TFCA. Following the infamous diamond rush in Marange in the eastern region of Zimbabwe, which brought global attention to diamond smuggling routes through the Chimanimani region (Saunders and Nyamunda 2016; Spiegel 2015a), new discoveries within the Chimanimani region drew migration for mineral extraction activity. Mainstream conservation discourse have projected both mobility of artisanal miners and panning operations in negative terms, associating these with ecosystem disruption particularly destruction of streams and watersheds (see also Critical Ecosystem Partnership Fund-CEPF-Research Report by Timberlake et al. 2016; Mawere 2011). However, critical research literature elsewhere in Africa has documented the economic and social importance of migration as a way of pursuing limited livelihood opportunities (Bryceson and Jønsson 2010; Jønsson and Bryceson 2009; Nyame and Grant 2014). Notably, Ingram et al. (2011) discussed a conservation/mining nexus along the Congo-Cameroon border, arguing for ‘assisting the poorest and socially excluded to practice mining legally’ (317), suggesting the importance of a counter-narrative to fortress conservation. The Chimanimani TFCA has been described recently by SADC as ‘one of Africa’s least-known nature reserves’ (SADC 2015, 1)—likely because other TFCAs, such as the Great Limpopo Transfrontier Conservation Area, have far more famous wildlife attractions with big animals that bring lucrative tourist income. No empirical studies to date have analyzed management plans of the Chimanimani Transfrontier Conservation Area, leaving questions of community engagement and ‘belonging’ under-theorized in its boundary areas. Accordingly, analysis below draws on research conducted in both the Zimbabwe and Mozambican sides of the border in the Chimanimani District in Manicaland and Sussundenga District of Manica Province, respectively, particularly in five sites (Chikukwa and Ngorima in the conservation area in Zimbabwe; Mahate, Gudza and Nyahezi in the buffer zone in Mozambique), four of which were mining locales including inside the TFCA (Fig. 1). Study locations in Chimanimani TFCA and surrounding communities. The research included semi-structured in-depth interviews as well as focus group discussion with 40 migrant artisanal miners (10 migrant artisanal miners in each of the four mining locations) who shared their life experiences. Interviews and in-depth discussions were also held with people from local communities, conservationists, traditional leaders, local authorities and government ministries responsible for mining and conservation. To contextualize longstanding socio-cultural and political ties between these communities, our discussions in the five different locales explored how kinship ties and social networks shaped the sense of ‘belonging’ that facilitated cross-border migration—as well as how the TFCA management strategies have been conceived and contested. As discussed below, some of the particular questions related to the influences of donor funding for the TFCA on the Mozambique side of the border, the influences of Zimbabwean institutions without donor funding on the other side, and the experiences of those deemed ‘illegal foreigners’ by officials. This paper forms one part of a larger multi-year interdisciplinary project, ‘Reconfiguring Livelihoods, Re-Imagining Spaces of Transboundary Resource Management: A Study of Mining and Agency along the Zimbabwe-Mozambique Border,’ funded by the UK Economic and Social Research Council (ESRC); the focus here is specifically on questions of belonging and issues of movement in the region. Engaging in multiple gold fields is often seen by miners as a resilience mechanism to cope with economic crisis, conflicts and decreasing gold deposits. Joseph—like other migrant artisanal miners—made it clear that preference is often given for high areas (mountains) rather than commonly known mining fields in order to avoid being raided by intimidating robbers. A traditional leader5 likewise reflected that migrant artisanal miners in the Rusitu Valley are occasionally attacked by gombiros6 from either Zimbabwe or Mozambique, prompting miners to further encroach in parts of Chimanimani National Park where gombiros rarely invade.7 Henry—like other artisanal miners—clarified that he migrated because the region also provides him with other economic opportunities: ‘I can do mining, farming and trade because I can move freely across the border’. The Chimanimani region has thus been conceptualized as both a safe haven and a space of possibilities, where moving towards the border—even if not crossing it—has been seen as a way to gain a sense of security. Environmental discourses in Zimbabwe have been heavily instrumentalised by political authorities to criminalise artisanal miners, some of whom have been told that their criminality is due to non-compliance with environmental impact assessment (EIA) reporting requirements (Spiegel 2017). The matter of TFCAs—like the matter of EIAs—raises questions about the fluid meanings of technical formulations of legitimacy and, as discussed below, becomes a powerful illustration of the politics of belonging. Such politics are elucidated by listening to concerns of migrant artisanal miners, including those on the Mozambican side who carry Zimbabwean identity documentation (ID) cards but are Mozambicans by ethnicity yet not allowed to mine in Mozambique because of a lack of a Mozambican ID. In a wider conceptual discussion, Gilmartin (2008: 1844) poses the question ‘Confronted with restrictions, suspicion and hostility, how might migrants address the broader questions of belonging and identity?’ As discussed below, in struggles to find livelihood possibilities including accessing extractive resources in the Chimanimani area, migrant artisanal miners have cultivated and resuscitated networks to sustain their existence in the community. Social ties (through marriage, existing kinship ties, and ethnic belonging) enabled migrant artisanal miners to be integrated into communities and appreciated as part of the community rather as the ‘other’—both those who moved closer to the Mozambican border and those who moved across it. To understand the micro-geopolitical dynamics surrounding resource struggles, it is necessary to appreciate how legitimate ownership of land and non-mineral natural resources have been framed by local people—and later used to define access to the extractive resources in the region. One Headman stated that ‘gold was discovered in our land here in Chimanimani Area and therefore access should be for those who own land under which gold was discovered.’8 The gold discovery was also understood through the spiritual lens; Chief Chikukwa attributed gold discovery as a gift from ancestors to relieve the people in Chimanimani from deep poverty of that time (referring to the 2008 economic crisis).9 In his account, the gold discovery was meant to benefit people with Chimanimani identity—those who belonged in the area as locals. However, reflections from migrant artisanal miners confirmed that crackdowns against Shurugwi migrants were also extended to all migrant miners irrespective of community of origin. Such tensions led migrant artisanal miners to attempt to formulate or rekindle strong social relationships with local people—including traditional leaders, gold dealers and police officials—cognizant that the dynamics of forming social capital through kinship ties, ethnic belonging and language skills constitute necessarily important determinants of access to local resources owned by local inhabitants (Bourdieu 2011; Schoenberger and Turner 2008). A migrant artisanal miner from Chipinge explained that his close relationship to police officers—who are maintaining order in the mining fields—spared him from attack.13 Thus, to have access to gold, migrant artisanal miners have been nurturing social networks with local people, also enabling them to access land on which to settle, thereby becoming locals rather than foreigners. A migrant miner from Gokwe explained how he was shielded from the attacks targeted to foreigners by his father’s friend who integrated him in his family and later assisted him to acquire land.14 Social ties were also forged by migrant miners by tracing kinship or by intermarriages; one miner from Chiredzi acknowledged acquiring land in Vhimba Community two years after marrying the Village head’s daughter proudly noting that he is now part of the royal family.15 Another migrant miner from Masvingo—a region that shares ethnic ties with Shurugwi—explained that his uncle (mother’s brother) protected him by incorporating him into a mining syndicate.16 To reinforce their newly acquired identity, migrant miners adopted local language skills that were critical for communicating with locals from both sides of the border. For example a migrant artisanal miner from Bocha (Zimbabwe) stated that ‘I survived the fierce operation maShurungwi dzokerai kumba (targeting migrants) because I mimicked the chiNdau dialectic to hide my identity…this even helped me when I crossed to mining areas in Mozambique or worked with artisanal miners from Mozambique who could not speak English17’. Territorial identities, critical in shaping eligibility in accessing or controlling natural resources—particularly gold deposits in the region, relate not only to becoming “local” but also being historically linked to “local”. The longstanding ties between communities in Mozambique and Zimbabwe provide a compelling rationale for seeking refuge or alternative living space when displaced. Ethnic ties across the Mozambique–Zimbabwe boundary were well illustrated by Chief Gudza who recounted that his chieftainship was originally from the Mbire District, across the border.20 One village head under Chief Mahate expressed that his community is more linked to communities on the Zimbabwe side of the border than those outside the Chimanimani region in Mozambique21—a sentiment echoed by other chiefs.22 As discussed elsewhere by Eilenberg and Wadley (2009), borders imposed by colonial rule artificially partition ethnic groups that transcend the territorial line of the state, obscuring how kinship ties and cultural identities can be crucial in cross-border migration. In the Chimanimani area, the long history of migration, and relationships between identity, place and mobility, condition notions of belonging that contest the categorization of migrants as ‘others’ without rights and entitlements. Dual attachment to Zimbabwe and Mozambique in the Chimanimani region has often been revived as a response to various waves of displacement in different epochs. Movement from Mozambique to Zimbabwe was first invoked during colonial times when there were few economic opportunities in the Mozambican side as compared to the Zimbabwean side. A headman in Gudza Community explained that his father left Mozambique in 1965 to work in tea estates in Chipinge District as there were fewer employment opportunities for Blacks in Mozambique during the Portuguese rule as compared to Rhodesia (Zimbabwe),’23 noting that although his family migrated back after staying for 25 years in Chipinge, his two sisters remained on the Zimbabwean side. Other traditional leaders in both Zimbabwe and Mozambique shared similar stories. A village head stated that ‘during colonial time Chimanimani region (Mozambique) was poorly developed there were no roads, clinics, schools and markets people used to depend on the Zimbabwe side for services…I recall when my late father who was the headman writing travel passes for Mozambicans who wanted to sort for employment in urban areas in Zimbabwe side.’24 Sharing a common language (chiNdau25) was critical in shaping a ‘ndauness’ identity (Patrício 2012) which is facilitating cross border movements in the region. Chief Mahate stated that ‘both communities in Zimbabwe and Mozambique speak chiNdau…this keeps us together and it makes movement to Zimbabwe simple…one will be able to present himself/herself in a culturally acceptable way when crossed the border.’26 Mobility of people from Mozambique to Zimbabwe was further increased in the post-colonial time when the country was affected by a civil war. Gorongosa National Reserve and Chimanimani forests—including Moribane Forests—harbored RENAMO27 guerillas leading to multiple displacements of local people by FRELIMO28 soldiers during the civil war.29 Given the multiple confrontations that were unfolding in the Mozambican side, many Mozambicans in the Chimanimani region made Zimbabwe their new home. Descendants of Mozambican migrants from his community who were in Zimbabwe returned, especially those embracing their ethnic and kinship ties.33 However, unlike in the Zimbabwean Chimanimani region as well as other communal areas in Mozambique where distribution of land to migrants is conducted solely by customary institutions, a centralized institutional framework has been adopted in the Chimanimani buffer zone. A Chimanimani National Reserve Community Officer exposed the fact that to avoid unsustainable encroachment, village heads are compelled to submit names of land seekers - foreign or local-and the size of land to be distributed, then conduct physical assessments before (dis)approving.34 This produces forms of disenfranchising local people from natural resources to which they have had traditional access, contradicting TFCA rhetoric of ‘strengthening’ communities to secure proprietorship over natural resources in order to be motivated to manage them sustainably. The above struggles by migrant artisanal miners in the region are indicative of exclusionary practices by state actors who invoke notions of citizenship to address perceived threats to the protection of the transfrontier conservation zone. Counterproductively, such restrictive measures have been undermining the transboundary objectives espoused by the state ostensibly aiming to both reunite communities divided by borders and allow mobile peoples to move across their traditional territories more easily. Additionally, as explored further below, critical reflection is needed on imbalances that are (re)produced when conservationists apply an agrarian-oriented livelihood lens that naively sidelines viable non-farm livelihoods such as artisanal mining, which supports rural economies throughout Sub-Saharan Africa including Zimbabwe and Mozambique (Huggins et al. 2017; Hilson and Maconachie 2017; Dondeyne et al. 2009). Various networks of state and non-state actors, with diverse motives for regulating people in the TFCA, have long shaped negative views about migrant miners. In the early years of gold discovery in the TFCA region, coercive measures in Zimbabwe were part of a countrywide crackdown called Operation Chikorokoza Chapera, ostensibly to bring ‘sanity’ and end ‘illicit’ activities (Spiegel 2009, 2014, 2015b). Although environmental protection discourse figured prominently to rationalize these actions, these masked other economic interests by elite actors and resulted in a range of unregulated mining activities within the TFCA. In Mozambique a joint force of military and police was dispatched in the region between 2009 and 2012—a reversal from the previous leniency of the Mozambican Government towards this activity and a noticeable contradiction to the advice of Ndunguru et al. (2006) who had warned that past law enforcement initiatives in Chimanimani had created conditions for corruption and abuses while resulting in “more scattered patterns of mining, rather aggravating the environmental impact” (p. 19). A Ministry of Agriculture and Rural Development representative argued that evicting artisanal miners was necessary to reverse the loss of biodiversity resulting from RENAMO guerilla encroachment in protected areas in Mozambique—including in the current Chimanimani TFCA41; and recently 10 Tanzanian artisanal miners were fined US$ 16.000 for mining in the Niassa National Park area (All Africa 2017). Yet, miners interviewed in our study argued that aggressive law enforcement came as a shock and created livelihood difficulties without effectively stopping mining. In Mozambique, a World Bank Project in the Chimanimani National Reserve attempted to shift communities in the buffer zone away from artisanal mining (in 2015),42 in keeping with one of the central goals of the TFCA, namely to promote sustainability by championing conservation agriculture as an alternative livelihood.43 Funding not only included resources and technical support to police artisanal mining within the buffer zone and core conservation area, but also to distribute beehives, tools (hoes, picks, exes, hoes, and shovels), seeds, training and market linkages to encourage adoption of less environmentally destructive livelihoods.44 However, this World Bank initiative has received criticism for several reasons, including its narrow approach to integrating economic concerns.45 An insider involved in the Chimanimani National Reserve dismissed the “alternative livelihoods” solutions promoted by the World Bank project—referring to conservation agriculture as unattractive to some communities. A traditional leader explained: ‘the whole community cannot do beekeeping … who would accept to grow beans (conservation agriculture) instead of artisanal mining which brings quick return?’46 A village head also revealed that some households are actually selling the tools they get from the MICAIA Foundation to artisanal miners in Musanditeera or are using them in artisanal mining themselves.47 Ministerial concerns were more focused on the time frame; a Ministry of Rural and Agriculture representative added that the World Bank funding is ending in 2019 and is too short for meaningful economic development and meaningful community participation.48 Similarly, Anderson et al. (2017) studying the Zimbabwe–Mozambique–Zambia Transfrontier Conservation Area (ZIMOZA) after the withdrawal of International Union for Conservation of Nature (IUCN) observed that local participation ceased—and lack of visible economic gains from projected ecotourism pushed local communities to overharvesting of natural resources. Brockington (2004) also showed that communities may undermine the establishment of a protected area by continuing to hunt, fish, log, farm, burn or embark other banned activities inside protected areas. In the Chimanimani context, rejection of donor-prescribed ‘alternative livelihoods’ projects can also be understood as related to what Scott (2008) termed ‘weapons of the weak’ whereby ‘powerless groups’ use any means to resist unrealistic rules imposed by governments or non-governmental organisations. Finally, for some people in the Chikukwa community, the environmental protection rationale for ceasing artisanal resource extraction seemed rather hollow as they were denied access to mining areas allegedly because of concerns for environmental degradation while a large diamond company was given access to mine areas adjacent to the Chimanimani TFCA. Specifically, a local Chief recounted that in 2006 when the Rural District Council of Chimanimani tried to formalize artisanal miners in the area, his community was promised mining claims but this never materialized allegedly because the area was adjacent to the Chimanimani TFCA, yet a large company DTZ-OZGEO (Pvt) Limited51 was given a permit to mine diamonds in the same region.52 Meanwhile, contentious environmental discourses were also invoked by authorities as key rationales to police artisanal miners in Mt Mawenje who, in turn, were furious over the harassment and fines charged by Community Based Natural Resource Management (CBNRM) committees and Environmental Management Agency (EMA). An artisanal miner explained that when he was caught mining by EMA in 2015 he was threatened with 5 years in jail if he could not pay the fine.53 Such experiences of ‘conservation governance’, seemingly inconsistent and mimicking colonial regimes of coercion and punishment, reflect how contemporary regimes for controlling protected areas have resulted in ultimatums, intimidation, rent seeking and fear rather than sustainable solutions. While in theory environmental stewardship goals could be embraced widely, these perspectives point to an extension of power that fits into established patterns of “articulating sovereignty” in the name of conservation (Lunstrum 2013) where modes of territorial and population control ultimately entrench uneven patterns of exclusion based on a discourse of non-belonging. Contradictory to the initial notion that TFCAs could become opportunities for equitable local development, the persistence of the above tensions also reflect how the real-world uses of notions of transfrontier conservation have led to forms of environmentalism that are simultaneously ineffective in ecological terms and perceived as unjust. The quest for a model for biodiversity conservation that promotes cooperation—and that could replace the legacies of conflict and fortress conservation in southern Africa—has led both regional policymakers and foreign donors to champion transboundary natural resource governance as a solution (Barquet et al. 2014). The rationality brought forward is that transboundary conservation areas can resuscitate local economic development whilst maintaining sustainable natural resources management (Draper et al. 2004). The southern Africa region has become aligned to the new global conservation priority of ‘people and parks’, which developed in the wake of the Bali declaration of 1982, that protected areas should ‘serve human society’ (Carruthers 1997). However, our analysis of the region leads us to argue that the concept of transboundary people-parks joins other abstractive development concepts such as ‘sustainable development’, ‘community ownership’ and ‘good governance’, which share a similar all-encompassing motivational purpose (Van Amerom and Büscher 2005) but can be simplistic and contradictory in its implementation. 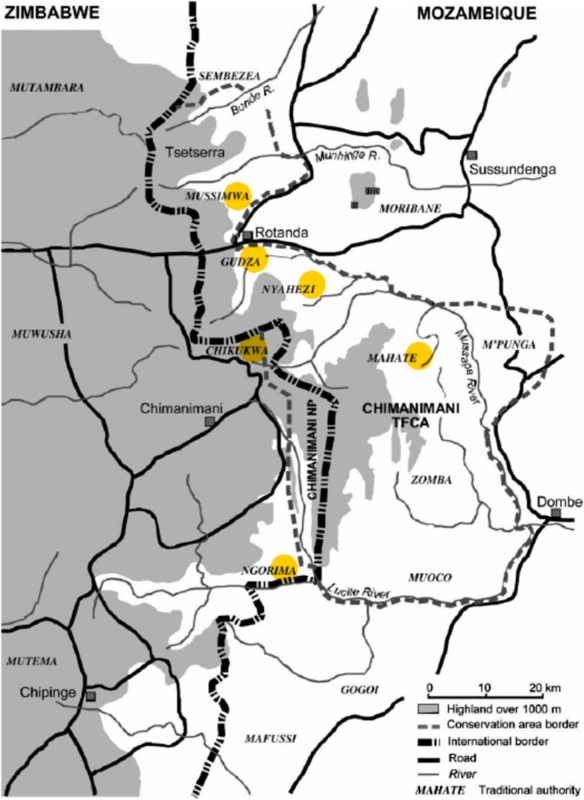 This article illustrated that the Chimanimani transboundary conservation project, though premised on local development through regional collaboration, has been embedded in processes of restricting livelihoods and decision-making opportunities, while advancing practices that gloss over kinship ties and a historical sense of belonging. Although serious environmental concerns bring together state and non-state actors in Chimanimani, the discourse is currently manipulated to restrict participation in resource management through employing practices that appear to many as inconsistent and unfair. Gaps between policy discourses surrounding TFCAs and territorialized practices of exclusion highlight the need for attention to how prevailing models are ineffective and how people in border zones adapt in the face of challenges, with uneven results. This article illustrates that the concept of free border movement is a far-fetched idea in this transboundary conservation area, with multiple access constraints and evictions of migrant artisanal miners in both Zimbabwe and Mozambique in ways often perceived to ignore kinship ties and historical realities. In Chimanimani, the territorial border, instrumantalized to reinforce citizenship identity as an exclusionary weapon to regulate mobility flows, reproduced forms of alienation that have led to ‘belonging’ dilemmas among local and foreign artisanal miners, confounded by historical identities that transcend political boundaries. This therefore brings us to the current debates on the politics of belonging—who has power to define who can belong? And what are the conditions (Delanty et al. 2008)—as a dialectal construct—that can be invoked for either socio-spatial inclusion or exclusion? In re-imagining the politics of transboundary conservation areas, the article challenges future researchers not only to entertain questions regarding the sustainability and viability of alternatives to ‘illegal’ livelihoods such as artisanal mining, but also to rethink the exclusionary notion of ‘foreignness’ in considering how the mobilities of people in TFCAs are shaped by kinship, ethnic and historical ties that must be recognized. Interview, artisanal miner, Rusitu-Ngorima, June 2017. Interview, migrant artisanal miner, Mt Mawenje, June 2017. Mt Binga is a mountain located within the TFCA that straddles both countries, though the interviewee here refers to the portion located in Mozambique. Interview, migrant artisanal miner, Rusitu-Ngorima, June 2017. Interview, headman in Ngorima, June 2017. This term in this case refers to local youth mafias. A different group of artisanal miners in the area stressed that many mining fields such as Tarka Forest that used to attract artisanal miners are no longer lucrative but ‘amaridhabhi’ (have been over-mined). A miner operating in Tarka Forest also expressed that ‘getting gold is now difficult here…usually it takes me three to 4 days to have few points of gold…the area has been exhausted’. Interview, Village Head, Ngorima, June 2017. Interview, Chief Chikukwa, Chikukwa, July 2017. Focus group discussion, traditional leaders, Vhimba, Ngorima, July 2017. Interview, Chief Chikukwa, Chikukwa Community, July 2017. Focus group discussion, traditional leaders, Muchadziya, Ngorima, July 2017. Interview, migrant artisanal miner from Chipinge, Mt Mawenje-Chimanimani National Park, July 2017. Interview, migrant artisanal miner from Gokwe, Haroni River-Ngorima, June 2017. Interview, migrant artisanal miner from Chiredzi, Tarka Forest-Ngorima, June 2017. Interview, migrant artisanal miner from Masvingo, Mt Mawenje-Ngorima, June 2017. Interview, migrant artisanal miner from Bocha in Vhimba Community, June 2017. Interview, migrant artisanal miner Mt Peza, Gudza, July 2017. Interview, headman in Gudza, July 2017. Interview, Chief Gudza-Mozambique, July 2017. Interview, Village Head in Mahate-Mozambique, July 2017. Focus group discussion Chikukwa community-Zimbabwe, July 2017. Key informant interview, Village Head in Gudza, July 2017. Interview, Village Head in Ngorima-Zimbabwe, June 2017. A Shona dialectic shared by communities (including Chimanimani region) in central Mozambique and southeastern Zimbabwe. Interview, Chief Mahate- Mozambique, July 2017. The Mozambique Resistance Movement (RENAMO) that was funded by the Rhodesian Government to destabilize Mozambique Independence. The national armed forces for the Mozambique ruling party, Front for Liberation of Mozambique (FRELIMO). Interview, Chief Nyahezi-Mozambique, July 2017. Interview, Chimanimani Lands Officer, July 2017. Interview, Chief Nyahezi, July 2017. Interview, Mozambican miner who returned from Zimbabwe, Mt Peza-Mozambique, July 2017. Interview Chief Gudza, July 2017. Focus group discussion, Mt Peza, July 2017. Interview, artisanal miner, Mt Peza, July, 2017. Interview, migrant artisanal miner from Mahate-Mozambique, Ngorima, July 2017. Interview, migrant artisanal miner Mt Mawenje-Ngorima. Interview, migrant artisanal miner (also working as a cattle herder) Mpunga Community. Interview, migrant artisanal miner from Dombe (Mozambique) living in Ngorima Community. Interview, Ministry of Rural and Agriculture in Sussendanga District Officer, July 2017. Interview, Ministry of Agriculture and Rural Development, Suusendaga District, July 2017. Chimanimani Transfrontier Conservation Area Memorandum of Understanding (2003). Interview, MICAIA Foundation Field Officer, July 2017. Interview, Chimanimani National Community Engagement Officer, July 2017. Interview, Village head Mahate Community, July 2017. Interview, Ministry of Agriculture and Rural Development, Chimoio, July 2017. Interview, Chimanimani National Park Management, August 2017. Interview, Chimanimani Rural District, July 2017. A joint-venture mining company owned by Development Trust Zimbabwe and Russian company Econedra Limited—during time of the study its operation was suspended by the Government of Zimbabwe. Focus group discussion Chikukwa Community, July 2017. Interview, artisanal miner, Mt Mawenje, July 2017. We would like to express thanks to all the people who participated in this research. This research was possible due to financial support from the UK Economic and Social Research Council (ESRC), for which we are also grateful. The study was funded by the Economic and Social Research Council (ESRC) in the UK, from an ESRC Future Research Leader Award that Dr. Spiegel received for this research project. We confirm that the article has conformed to all ethical standards. There are no conflict of interest. Informed consent was provided by participants, consistent with all appropriate protocols. All Africa. (2017). Mozambique: Illegal miners to be deported to Tanzania. 18 August. http://allafrica.com/stories/201708190009.html. IRIN. (2007). Gold fever infects young and old. http://www.irinnews.org/feature/2007/05/02/gold-fever-infects-young-and-old. Accessed 14 Nov 2017. Ndunguru, E., Dondeyne, S., & Mulaboa, J. (2006). Illegal gold mining in the Chimanimani National Reserve: Environmental and socio-economic assessment. Ministry for the Coordination of Environmental Action, Chimoio. https://www.communitymining.org/attachments/263_Illigal%20gold%20mining%20in%20Chimanimani%20NR_2007.pdf. Accessed 14 Nov 2017. SADC. (2013). Transfrontier conservation areas in Southern Africa. http://www.sadc.int/files/4614/2122/3338/SADC_TFCA_Programme_FINAL_doc_Oct_2013.pdf. Accessed 14 Oct 2017. SADC. (2015). Chimanimani transfrontier conservation area. https://www.giz.de/en/downloads/giz2015-en-tfca-chimanimani.pdf. Accessed 7 Sept 2017. Swradio Report. (2007). The death of Chimanimani transfrontier conservation area. http://www.swradioafrica.com/Documents/ChimanimaniArticle.pdf Accessed 7 Oct 2017. Thielke, T. (2008). Digging for Survival: The Gold Slaves of Mozambique. Spiegel Online. https://www.spiegel.de/international/world/digging-for-survival-the-gold-slaves-of-mozambique-a-543047.html. Accessed 15 Nov 2017. BirdLife International (2012). Eastern Afromone Biodiversity Hotspot. https://www.cepf.net/sites/default/files/eastern_afromontane_ecosystem_profile_final.pdf. Accessed 20 Sept 2017.